Today Smile Software released TextExpander 4, the latest version of its typing shortcut app for OS X. The new version contains several new types of fill-in snippets, including support for multi-line text fields, pop-up menus, expanding snippets while filling in text fields, and more. 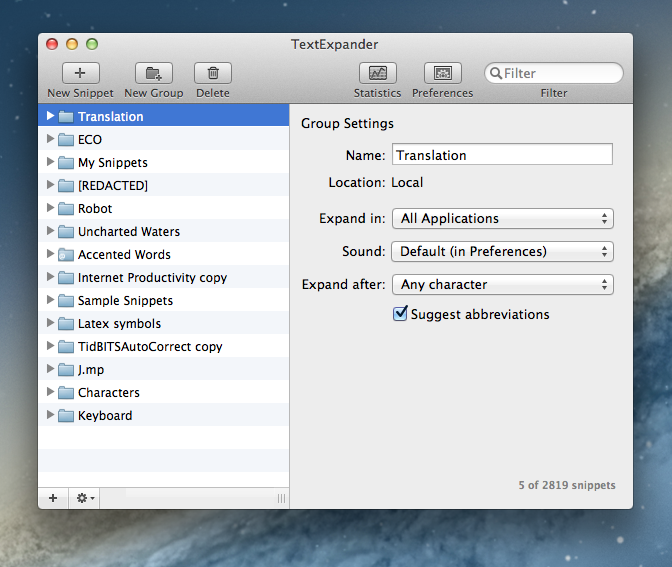 In addition, the UI has been slightly updated to match the monochromatic style of Lion and Mountain Lion, and snippet groups for French and German autocorrection are now part of TextExpander’s predefined group options. And in news that is sure to please anyone who has tried and failed to get their friends and family to understand the benefits of typing shortcuts, TextExpander 4 now includes a tutorial called the Snippet Creation Assistant, which will launch upon a fresh install of the app and guide new users through the process of making their own snippets. TextExpander 4 also marks Smile’s break from the Mac App Store due to the sandboxing rules that went into effect on June 1st, making it the first major casualty of the new restrictions. Fortunately for Mac App Store customers, Smile has gone the extra step to ensure a smooth upgrade from the MAS version to their direct sale version. Once TextExpander 4 has been downloaded and launched, it will recognize existing MAS versions of TextExpander 3 and offer users the same discounted upgrade price as direct customers. As of this writing, TextExpander 3 is still on the Mac App Store and has not been updated with information about TE4 or the upgrade process. TextExpander has been one of my most valuable apps for years and I highly recommend anyone who has yet to try it to download the demo from Smile’s website. TextExpander 4 costs $34.95 for a single license and $15 to upgrade from a previous version, with additional options for family packs and businesses. Any customer who purchased Text Expander 3 after January 15, 2012 can upgrade to TE4 for free. TextExpander 4 is available for purchase from Smile Software’s website here. The company’s official press release, which includes the full list of new features and changes, can be found here.